Rating: 2 out of 5 OK, so what am I missing? Some say they work great and others say not so great. Mine arrived today and I tried the ½” on soft maple and the chisels would not make a dent. I tried it on pine and the same result…not a dent. The bit seemed to drill just fine. I have bought mower blades and pocket knives that needed to be sharpened out of the package…do these chisels require the same? At this point, I would not recommend this product. Rating: 3 out of 5 I'd always wanted to use some mortised joints in my projects so when the mortise package showed up in the email specials I'd thought I'd go ahead a bite the bullet and order the Mortising Package - glad it was on sale and I didn't spend full price on it. Overall the mortising attachment and hold down seem solid, functional and everything fitted up nicely. The chisels seem to be decently made, I was expecting to have to sharpen them (typical with almost any chisel of any kind I've ever purchased) and they sharpened well and have been holding an edge while I practice making mortises. 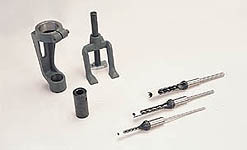 The mortising bits are very cheaply made and finished. I don't think I've ever gotten anything that poorly made even from Harbor Freight! There was no edge to speak of on the bits and the burrs were huge, I spent more time cleaning up one of the bits that I did sharpening all the chisels. After taking care of sharpening everything I found that they seem to make reasonable mortises. They bottoms do need to be cleaned up a little with a hand chisel and the finish isn't great - but hey, you glue a tenon in there so it's fine. To summarize, I was pretty disappointed in the quality of the bits in particular. The edges were so poor I a not really sure that I got the angles any where near correct but they seem to work if you proceed slowly with shallow cuts as the instructions describe. But overall, the quality of them is not quite up to what I typically expect from Shopsmith. Rating: 1 out of 5 Look for used American-made Shopsmith mortising chisels on ebay. The ones sold now are such poor quality Taiwanese imports, they simply don't work. If you want that kind of junk, why pay these American prices here. The American product sold for years at Shopsmith could not be beat. Don't waste your money on the mortising stuff sold now. Rating: 1 out of 5 I just purchased the mortising set and while the mortiser itself seems solid I can't say that much for the bits/chisels. I have tried all three right out of the box and they won't make a dent in red oak. The bits do their part but the chisel won't go any deeper than the points on the corners. I even tried them on soft pine and got the same result. The edges look sharp but the heavy mill marks tell me the chisels are not even close. I would rather see quality bits/chisels as an option. I was looking forward to using this as I have a project ready for mortising. Back to the forstner bits. Shopsmith...I don't think asking for a tool to work right out of the box is unreasonable. Rating: 4 out of 5 I used the 3/8" mortising chisel to build two mission style dressers out of red oak. After successfully completing (20) 3/8 x 2 1/4 slots through 1 3/4" stock, I would say they work pretty good. Rating: 4 out of 5 I found this to be very useful. The only shortcoming is that the hollow chisel dulls quickly when used on hard woods and accurately sharpening the chisel is almost impossible to do. I ended up ordering a new chisel. Rating: 4 out of 5 I haven't had any problems, great tool, but the chisels could be made a little harder because they dull too quickly. But buying aftermarket chisels wasn't a problem either. Thanks for a good product.